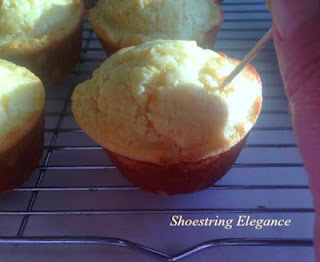 Shoestring Elegance: Fresh Squeezed Orange Juice Muffins-Springtime in a Muffin! 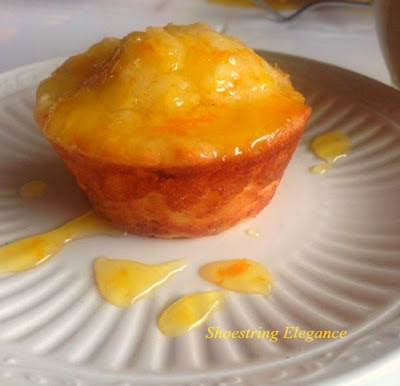 Fresh Squeezed Orange Juice Muffins-Springtime in a Muffin! It seems that as we draw closer to the end of February the pull towards all things Spring is inevitable. We've bundled up and enjoyed our Autumn breezes, we've celebrated with our family and loved ones for the holidays, looked, longingly, at our fireplaces and snuggled with a good book or old movie, now we look to the promise of Spring. Spring begins in just a few weeks. Yep, March 20th, by my calendar, here, in the United States. Unfortunately, I do realize that many of you on the East Coast and in other parts of the world are still looking at lots of cold days to come this year. Whilst others are in the 90's. Goodness! No matter, I have the perfect, refreshing, welcoming Spring, cheer up your Winter, or refresh your Summer recipe right here! I have seen versions of this recipe in Allrecipes, Bon Appetit and other periodicals. The funny thing is, everyone had their own tips, twist and tricks to it, so it never reads exactly the same. I, actually, really love that. I am no exception. I made changes to it, as well. It actually tastes even better than it looks! Okay, so you ask, what's the recipe?! I'm going to give you my version and suggest some of the options others have used. It's all about making it your own and using what's available to you. They still will turn out phenomenal, even with alterations!This recipe will make you one wonderful pan of 12. I can almost guarantee you will be making them again, and probably very soon after your first batch. Isn’t that wonderful?! Make sure you give them some good pokes! You sure want to make sure they soak up all the fresh juice glaze you can get into them! Then, just look at what you end up with!! Don't worry, no way these will be around long enough for you to be concerned that there is just too many for you! 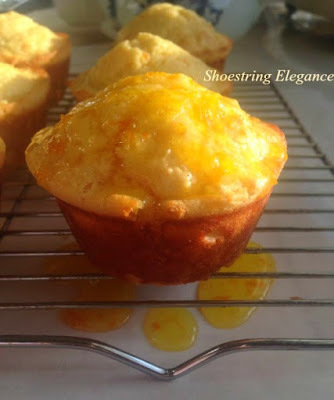 I really should be calling these “Vanishing Muffins of Sunshine”! This is what Your Orange Juice, pulp and zest should look like for your glaze. In no way thin or see through. No straining out the best ingredients of all! You have all been wonderfully patient with me, and I appreciate it, here's the recipe. I, do hope you enjoy them. 2 Tbsp of sour cream. 1-1/2 Large eggs, (if you've never done this, simply whisk you first egg and add it to wet mixture, do the same with the 2nd, only pour half of it out and use the rest, 2 really is too much and I didn't find 1 to be enough! Preheat your oven to 400F. Combine dry ingredients and use a whisk to combine and aerate the flour mixture. Combine your Orange juice, pulp and zest, with your melted (and cooled)butter, eggs, with yogurt and sour cream preference. Pour over your dry ingredients and, with a spatula, fold together until just combined. do not overwork your muffin batter. 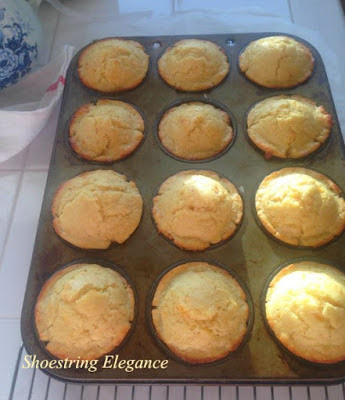 Butter or line your 12 muffin tins and divide the dough into all 12 tins. Don't worry they grow. Bake @ 400 until toothpick comes out clean, approximately 13-16 minutes. depending on your oven. While your muffins are cooling, some, you're ready to make your glaze! 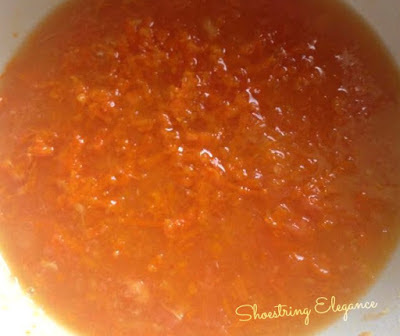 In a saucepan, combine the juice, pulp and zest from 2 oranges, med sized or 2 tangerines if you like. 2/3 cup of powdered sugar on medium heat until you get a nice glaze consistency, about 5-7 minutes on medium heat. 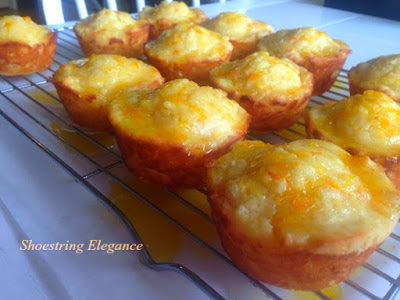 Now, with a toothpick, poke the tops of your warm muffins about 4-5 times each and then spoon your orange glaze over them. The little holes will allow some of the yummy goodness to soak into the muffin. Cool and Enjoy! If you can't wait for them to completely cool, just enjoy! Those sound deee-licious! Question: When the recipe calls for zest do you grate the skin of the whole orange? Until you have how much--one or two tablespoons? I really want to make these! I love, love your comments and I do read every single one. They totally make my day. If you have a specific question, make sure I can answer you back by adding your email to your google/blog account! Thanks so much for the visit. Subscribe or contact me, Here! My Other Shares with You!! February's Ruby Magazine is Out!! NEW! Follow me on Tumblr! 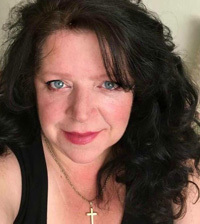 Visit Theresa's profile on Pinterest. All views ideas and recipes are my own, unless otherwise stated in a specific post. Simple theme. Powered by Blogger.